The following links will let you download the class presentations along with other materials like SketchUp Models, spreadsheets and other supplemental information that we use in class to illustrate a point or for an interactive exercises. I will also post any materials we develop or reference during the class each day after class in a follow-up folder for the day. For the Webinars, I will typically put the slides for a session up on this page sometime the day before the session or early in the morning of the session. For this session, we are asking you to revisit the pump optimization calculations you did applying the techniques that were illustrated in the webinar where I demonstrated how to assess the savings associated with placing the Hand-Off-Auto selector switch for the lead evaporator pump back into the "Auto" position. The spreadsheet file to the left is the file I created during the call. I also inserted my actual calculations for all four climate zones into it so you can reference them if you want to. And I believe Irma recorded the session and will be making that video available for you also. If you want to use Plot Digitizer to make an electronic pump curve, you will find that link on the Plot Digitizer page of the website. In addition, you will find a spreadsheet that is all set up for you to use to generate a pump curve once you have digitized the data on the Plot Digitizer Pump Curve Example page along with an informal video showing how to go about using Plot Digitizer and load the data into a spreadsheet to make the curve. If the discussion about slip and how induction motors work got you curious and you want to know more, you will find a set of narrated PowerPoint slides on the Induction Motor Principles page of the web site that walk through those concepts. There are a couple of videos where I do some simple experiments to demonstrate induction on the Induction Principles page. And if you want to see a pump test happen along with observing how the slip and power draw of a motor changes as you throttle the discharge valve, you will find a video of that on the Testing a Pump page of the web site. The document below contains the instructions and supporting you need to develop two selected findings in the chilled water plant; the selector switch that is in "Hand" and the evaporator pump that is throttled. We will discuss the exercise in the webinar on Monday, April 8, 2019. So, we are asking that you work with your team to answer the questions and perform the calculations as indicated in the document. Please send your answers to Barry with a copy to myself no later than close of business Friday , March 5, 2019 if at all possible. Note that you will also need the information provided below for SketchUp Model Exercise 1, including the answer key. The files in the zip folder to the left are the files you need to work on the scoping a ball room air handling unit exercise. We will discuss the exercise in the webinar on Monday, March 25, 2019. So, we are asking that you work with your team to answer the questions included in the building description file and send your answers to Barry with a copy to myself no later than close of bussiness Friday , March 22, 2019 if at all possible. The zip file contains the following items. ​Hyjend Hotel Ball Room System v1.pdf; this is the information that sets up the exercise and includes the questions we would like you to address. Ballroom AHU v19 SUv8.skp; this is the actual SketchUp model. I have tested it by opening it in a copy of SketchUp version 8. So I think we are good to go with it. Scene Guide Ballroom AHU v1.pdf; this is simply a little cheat sheet to help you use the numbered scene tabs. The files in the zip folder to the left are the files you need to work on the scoping a chilled water plant exercise. We will discuss the exercise in the webinar on Monday, March 11, 2019. So, we are asking that you work with your team to answer the questions included in the building description file and send your answers to Barry with a copy to myself no later than Friday morning, March 8, 2019 if at all possible. AEP 2019 First F2F final align.pptx, which are the slides Barry shared Friday morning before we started our lab rotations. ​Hyjend Hotel Building Description v1.pdf; this is the file that provides an overview of the facility that is served by the central plant and sets up the exercise (along with several that will follow). It includes a list of 10 leading questions that are intended to guide you through the exercise. These are the questions we will discuss in the webinar, and these are the questions Barry and I are asking you to be prepared to answer at that time. Ideally, we would like to get a copy of your answers prior to the webinar, as indicated above. Plant V34 SUv8.skp; this is the actual SketchUp model. I have tested it by opening it in a copy of SketchUp version 8 and I noticed some of you moving around in it on Friday morning. So I think we are good to go with it. Scene Guide Chiller Plant v34.pdf; this is simply a little cheat sheet to help you use the numbered scene tabs. The zip file to the right contains and answer key for this exercise, including my comments on the answers submitted by the various teams and the findings list for the issues that are built into the model. The zip file to the left contains the slides from the 7tj webinar, which focused on centrifugal machines. Centrifugal machines are the work horses of our HVAC systems; all of the fans we use are centrifugal or axial flow fans; 99% of the pumps are centrifugal too with the most common exception being oil pumps for generators and boilers and chemical feed pumps, which are sometimes positive displacement. Chillers come in a variety of "flavors" but a common one is "centrifugal". So, bottom line, understanding how centrifugal machines work can be very beneficial if you are working in our industry. The Skills worksheet with additional boxes checked off from this class session to give you a sense of where you should be in terms of the self study effort. There is a slide that shows the relationship between psi and ft.w.c. (slide 8; the tall, 1 inch on a side glass tube that you fill with water concept that I described). More detail on Net Positive Suction head, including the resource I alluded to and example of using the resource (slides 15-20). Improved animation and detail about how reducing pump speed tends to preserve or even slightly improve pump efficiency. (slides 21-26). 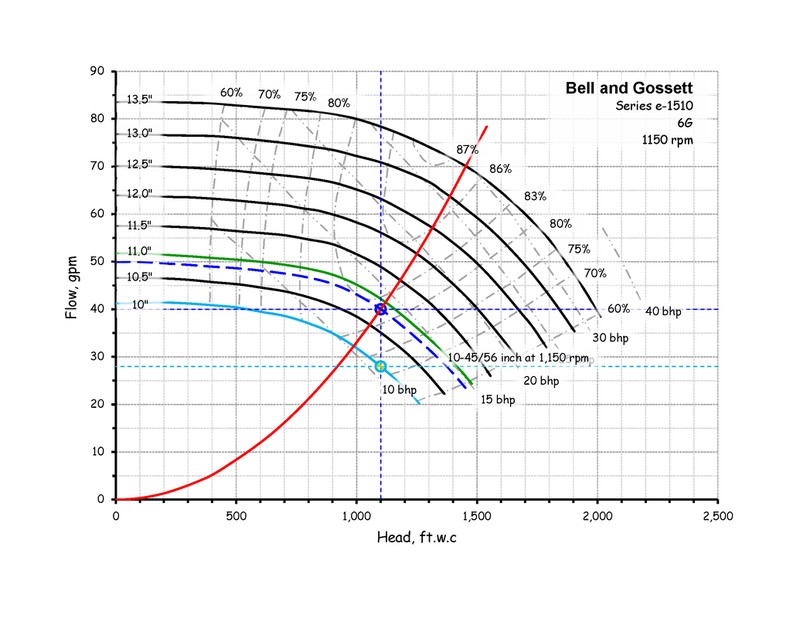 An example of a fan static pressure loss calculation along withe the associated system diagram. Note that the system diagram associate with the fan static pressure calculation is for a high rise and is one of the most complex air system diagrams I have ever done so you may find it interesting in that context. It was worth the effort because it allowed me to diagnose a number of issues that were mysteries up until then. To give you a sense of that, I have included a copy of the section of the report I wrote that discusses the issues using the system diagram to illustrate them. During the class, I also mentioned a number of other resources that you might want to reference. There are a number of blog posts about how you derive the unit conversion constant for some of the basic HVAC equations we use. The altitude correction factor spreadsheet I mentioned is under the Tools page of this web site. There is a video demonstrating how to perform a pump test, including documenting how the various parameters like pump kW and differential pressure change over the course of the test on the Videos page of this web site. A while back, I did a blog post on air entrainment and cavitation in condenser water systems that has a section specifically about cavitation that will supplement the discussion in the presentation this morning and the enhanced slide set included with the zip file. The same blog post I mention in the previous bullet also has a section about Net Positive Suction Head that will supplement the discussion this morning and the other resources I mentioned on the topic. 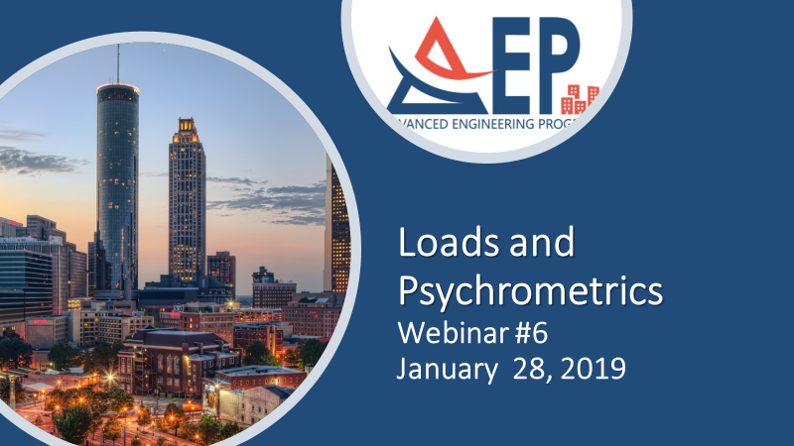 The zip file to the left contains the slides from the sixth webinar, which focused on loads and psychrometrics. At the end of the day our systems need to closely follow the load profile if they are to perform at peak efficiency. As you hopefully gleaned from the webinar, the load profile can be quite dynamic and will vary from hour to hour and season to season. For most Building System applications, virtually all of the end use loads are served by supplying conditioned air, this it is important to understand how air, in particular, moist air behaves. This is what the science of psychometry is all about. That is why knowing how to use a psych chart is such an important skill for those of us who work with building systems. A folder with a paper about the Cooling Load Temperature Differential method of load calculation along with the tables you need to do the calculation. A paper that compares three common software programs that are used to model buildings and develop the load profile for design purposes. The spreadsheet with the load profile that Sabastian and I created for the Atlanta Airport Marriott's chilled water system. It is an example of the building telling us what the load profile looked like, which is a lot more accurate than any calculation or model you can do since it contains no assumptions, just reality. Of course, the reality might include load elements that should not be there, like the dysfunctional economizers we have identified at the Atlanta Airport Marriott. As a result, the building also pointed us at some opportunities to improve things. The psych chart we developed during the webinar. You may want to begin your exploration of the psych chart tool by opening it up and adding some more constant lines to it, looking up the design conditions for your location, and doing a bin plot of the climate for your location. The skills table with boxes checked to illustrate about where you should be in your self study effort. A blog post that walks you through the basic operations you can do with your electronic psych chart tool, along with highlighting the benefits of the professional version that you have. Note that the chart in the post is the Pacific Gas and Electric company version of the hands down software tool. But it literally is the same software as your chart with a different color theme and logo applied to it, so the steps I discuss in the blog post will work with your version of the tool. Also note that the free version of the PG&E chart is much more limited than your version is. You have what amounts to the professional version of the chart, which is what I highlight at the end of the post. A number of additional blog posts on psychrometrics and the psych chart, including several posts that show you how to go about building your own chart using basic psychrometric relationships and Excel. The Honeywell Gray Manual, which has a good, basic chapter on psychrometrics. One way to learn how to use your new tool would be to work through that chapter and do the exercises in your tool instead of on a paper chart. The RCx University web site, which supports a program for the Construction Engineering Research Laboratory (CERL) that is very similar to the AEP program. The site is organized around the same 10 skills that we use to organize the AEP program and the HVAC Fundamentals page includes a number of psych chart topics. Finally, I meant to highlight one additional resource during the presentation but forgot to do it. You may have already found this via the Resource List and EBCx Guidebook. But if not, you will want to check out KW Engineering's Get Psyched Excel plug-in. ​Once you have the plug in installed, you will discover that Excel now has functions that you can use to calculate psychrometric properties from a dry bulb temperature and any indicator of humidity, including dew point, relative humidity, wet bulb temperature and humidity ratio. That means if you log the temperature and humidity change across a cooling coil, you can use those two logged pieces of data to calculate enthalpy entering and leaving the coil and then use the enthalpy difference to calculate the load on the coil; pretty handy! The zip file to the left contains the slides from the fifth webinar, which focused on data logging and trending. The data you collect from your loggers and control system will be one of the ways you start to have a dialog with your facility. The folder also contains a copy of the Skills table with boxes checked to show about where you should be in your self study effort along with the two SketchUp models I used in the webinar in case you want to play with them and practice your SketchUp navigation skills while waiting for the "Easter Egg Hunt" model. There is also a copy of the data logger file from my little test to see how fast the domestic hot water temperature came up in my hotel room if you want to look at that. During the webinar, I pointed you at a number of resources including the following. The Onset web site is full of resources to help you understand how to work with their logger including webinars, self guided training, and how-to videos. One of the resources on the Data Logging Page that you might find to be particularly useful is a video that Bill Pottinger made that shows you how to deploy your motor logger. Bill was the lead at the Pacific Energy Center's tool lending library until he retired earlier this year and does a great job of it. While the video is specific to the motor status logger, the techniques you use to interface to it to launch and retrieve data are very similar to the way Hoboware works with all of the Onset loggers. If your facility happens to be in the California Public Utility Service Area, you can use the resources in the Pacific Energy Center tool lending library. In addition to loggers, the library literally has thousands of other tools that are ideal for people doing building science and commissioning work. You will find a copy of the Monitoring Plan I showed during the webinar along with a blank version of it on the Monitoring Plan page of this web site. The zip file to the left contains the slides from the fourth webinar, which focused on system diagrams and the system concept. These concepts are important commissioning tools and the system diagram itself will serve as a framework for developing your monitoring plan and figuring out what you need to do to test the system you have targeted for your personal project. The folder also contains a copy of the Skills table with boxes checked to show about where you should be in your self study effort. There are a string of blog posts that are essentially a text book on how to develop system diagrams. This link will take you to a page that has all of them linked from it. The system diagram symbols page of this web site has a PowerPoint tool that contains common system diagram symbols for air handling and pumping systems along with an example of an air system diagram and a water system diagram that were created in PowerPoint. For those with access to AutoCAD or software that will open .dwg or .dxf files, there is a zip file with all of my AutoCAD system diagram symbols in it along with air and water system diagram examples in the form of AutoCAD files. The zip file to the left contains the slides from the third webinar, which focused on scoping and obvious indicators. In other words, it was about how to pick up on clues regarding opportunities to improve performance and save energy. This will be an important skill for you to develop because it will help you firm up the estimated savings potential associated with applying your AEP skills to your facility for your February 4th GM report. As you learned in the first webinar, you can project the savings range that might be achievable for your facility by applying industry metrics from the LBNL Cost and Benefit of Commissioning report to your annual utility costs. This, of course, is a hypothetical number that is based on savings in other buildings but rooted in your actual consumption patterns. we were able to fairly accurately estimate the savings that would be achieved if we addressed the problem. So, the idea is for you to do the same thing in your facility, creating a list of your observations as you go so that you can prioritize them and target one of them for your personal project. In the commissioning industry, this is called a "Findings List" and I included an example from my first walk-through of the Columbus Renaissance, where we held the field part of the 2015-2016 AEP class in the zip file above. Bottom line, your projected savings and your findings list along with a brief narrative or presentation explaining what the numbers mean is all you need to do to produce your report for your GM. As Barry mentioned during the webinar, you could use Slide 14 from the presentation as a template for presenting your savings, and as I mentioned towards the end, you could adapt the Columbus Renaissance findings list as a way to document your targets; it really is just a table that itemizes the things you want to pursue to capture your projected savings and help you track your progress. The EBCx Guide Book, which provides an overview of why the various EBCx skills matter and points you at resources for learning them. The Resource List on this web site provides a good supplement for resources to learn more about the 10 Skills. The EBCx Skills Checklist, which you can download from the same page as the Guide Book, is a way to track your progress and also has links to resources for each skill. I mentioned using regressions and data clouds as a way to understand were opportunity might lie. While this is an advanced skill and not something you absolutely need to focus on, if it tweaked your interest, I have done a number of blog posts that include videos that walk you through how to go about doing it. The spreadsheet I used to assess what the mixed air temperature should be for a given outdoor condition, return air condition, and outdoor air percentage can be found on the Mixed Air Calculations page of this website. If you want to understand the physics behind the relationships in the spreadsheet, then you may be interested in the blog post I wrote that derives them from the steady flow energy equation. You will also find a number of blog posts that provide examples of scoping and related opportunities. This link should give you a page full of them and they may give you some ideas to pursue in your facility. The zip file to the left contains the slides from the second webinar, which are focused on the bench marking and utility consumption analysis and how that information can be used to help establish budgets and expectations for your project. These are the basic steps you need to perform to develop the cost recovery report for your GM. The spreadsheet behind the bench marking and utility analysis I did for the Atlanta Airport Marriott based on their 2013 utility data is included in the zip file above. I actually wrote a blog post about the technique I discussed in the webinar an illustrated it with the Atlanta Airport Marriott data. So if you want a refresher on what I presented along with a more in-depth discussion of the topic and techniques, you will find that blog post at this link. The blog post about Site vs. Source Energy is at this link. This link should open up a page on the blog site that has a listing of all of the blog posts I have done about doing scatter plots and regressions. Technically, that is further along than you need to go right now. But if my illustrating the technique caught your interest, I think you will find some useful in these posts, including videos demonstrating the Excel techniques associated with the process. A blank copy of the Utility Consumption Analysis spreadsheet tool (UCAT) that I highlighted in the presentation (slide 56) is included in the zip file. The paper I wrote for ICEBO is located on the Resources page of this website under Materials from Classes and Presentations - ICEBO. This link will take you to the page that has the EBCx Skills Guidebook and the spreadsheet tool for tracking your progress. This link Resource List will take you to the page with the Resource list. This link will take you to the page with Bill Coad's Energy Conservation is an Ethic paper. This link will take you to the paper I did about the dysfunctional AHU at the Komatsu clean room.